When many wheelchair users think of a seat cushion, comfort comes to mind. 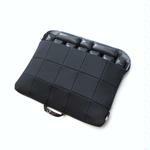 However, a seat cushion provides benefits well beyond comfort, including pressure management and positioning that can reduce fatigue and enhance seated balance throughout the day. Surely, not everyone's positioning and sense of comfort is the same, so understanding cushion technologies is key to selecting the right cushion for you. Indeed, there are many wheelchair cushions available - including foam, gel, and air technologies - and in understanding the benefits and limitations of each one, you can decide which is best for you. Foam cushions are the most basic cushion, ideal for those wishing simplicity at minimal cost. 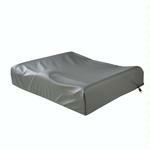 While some foam cushions are a single-density (firmness), others feature contoured bases with multiple layers of foam, designed for enhance pressure management and positioning. Gel cushions are specifically designed to optimize pressure relief by allowing one's pressure points to "immerse" into a gel pack, reducing pressure. 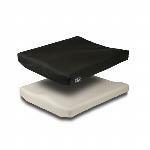 Additionally, gel cushions typically feature a contoured base, with advanced positioning characteristics. As the name suggests, air cushions are filled with air, and by adjusting the air pressure, the cushion's firmness can be adjusted. Air cushions typically offer reduced stability and positioning by comparison to foam and gel cushions, but are exceptional in the area of pressure relief, allowing pressure points to "sink" into the cushion. Air cushions are commonly available in 2" and 4" heights, with the 2" offering a low-profile, more stable surface, and the 4" offering maximum pressure relief.